The 1911 Santa Fe Railway Depot is one of the first sights when coming to the city. The station was an important establishment in the growth and development of the city, providing easy connection for the transportation of people, mail, and resources. The depot was one of four Santa Fe Railroad stations designed by Kansas City, Missouri architect Louis Curtiss (1865-1924) during 1909-1911. Of the four Texas depots, only the depot buildings in Snyder and Post remain. The Snyder Depot was constructed with reinforced concrete, which was also used in the architectural ornamentation. The design of the four railway depots was based on one architectural design that was altered slightly per location of depot. 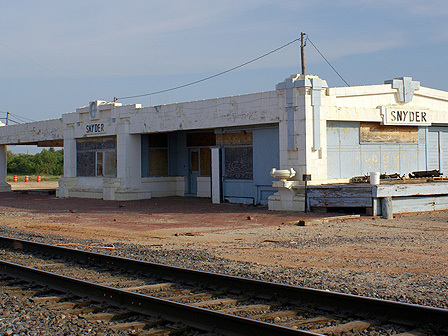 BNSF Railway reports that plans to demolish the Santa Fe Railway Depot are currently on hold. Click HERE to sign a petition urging them to stop demolition. Contribute to our Endangered Places Fund to support advocacy efforts by clicking HERE. After years of efforts to save the depot, the building was demolished in November 2017. For more information, read this article in the Lubbock Avalanche-Journal.